Adjure's new "Sunset Blvd." style bucket features a sleek new look. It has a continuous taper from the front to the pointed rear end. This model has a frenched bezel and smooth chrome housing with one of our Diamond Cut lamps. Our "Phast Lock" design makes this bucket easy and fast to assemble and disassemble making changing bulbs (without any tools) a breeze. 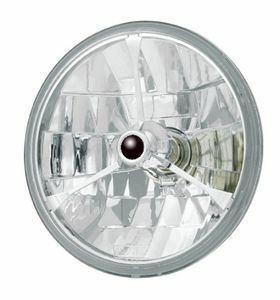 Each headlight comes with a 3/4" polished aluminum mounting block, bulb harness and a xenon filled H-4 55/60 watt bulb. Just bolt it on, plug it in and take a ride. NOTE: Installing a higher wattage or blue tint bulb will void your warranty as it will eventually cause damage to your lamp and/or wiring.